The U.S. government believes Russia has sent a specialist military cybersecurity team to Venezuela in a bid to prop up beleaguered President Nicolás Maduro. Two Russian air force planes landed near the capital city of Caracas on Saturday, with around 100 soldiers aboard. According to Reuters, U.S. officials now believe the group included cybersecurity experts. Venezuela remains mired in a political crisis with two men claiming to be president. Maduro, who succeeded revolutionary leader Hugo Chavez after his death in 2013, won last year’s presidential election amid accusations of irregularities, suppression of critics and a boycott by much of the opposition. Arguing this makes Maduro an illegitimate dictator, 35-year-old Juan Guaidó—the leader of the opposition-controlled National Assembly—used a clause in the national constitution to declare himself interim president until new fair elections could be held. The U.S. and a host of South American and European nations have lined up in support of Guaidó, hoping their pressure would be enough to topple Maduro’s corrupt and ailing regime, which has been accused of a wide range of human rights abuses. But Russia and China are supporting Maduro. Both nations are major investors in the Venezuelan economy, and especially its vast oil fields. Venezuela is also a major customer for Russian arms, and the two nations have been increasing military cooperation despite increased economic and diplomatic pressure from the U.S.
As for Cuba, the White House has accused the regime in Havana of propping up the Maduro government. According to The Washington Post, the U.S. believes there are as many as 25,000 Cuban military and intelligence personnel working in the Venezuelan military and intelligence services, and even Maduro’s personal guard. 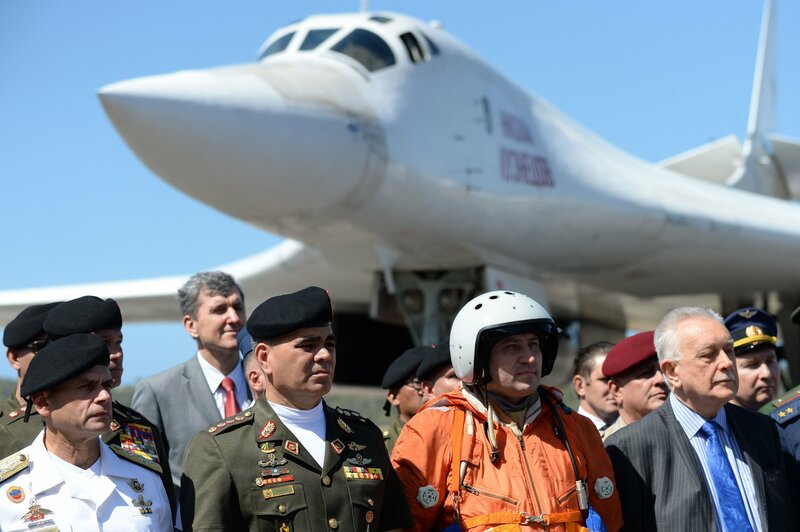 The Venezuelan government has confirmed that the two planes landed from Russia and were authorized by Maduro, but has not provided any more details on those aboard nor the reason for their deployment. Reuters suggested the cybersecurity team could be tasked with surveillance of anti-Maduro elements and protection of the government’s cyber security infrastructure. Venezuela is currently wracked by mass power outages, which Maduro has claimed have been caused by American cyberattacks. The Russian Foreign Ministry said the transfer of “Russian specialists” was governed by a military-technical cooperation agreement made between the two nations. Russia has also accused the U.S. of meddling in Venezuela to promote a coup against Maduro. On Tuesday, Foreign Ministry spokeswoman Maria Zakharova said American pressure would not change Moscow’s stance on Venezuela. And Venezuela’s National Assembly is set to demand that Guaidó “order those people who, trespassed on Venezuela’s territory, to leave immediately,” opposition politician Eliezer Sirit told a parliamentary session, according to Russian state news agency Tass.